The Kateri Shrine in Fonda NY (35 miles west of Albany) has served as a sacred site for many peoples and civilizations. It shows that people, no matter what their race or religion is, are drawn to the same sacred place over and over again. The love and consciousness from previous civilizations still remains and serves as foundation to which the pilgrim can add to. It is a powerful place of prayer. The shrine is dedicated to Kateri Tekakwitha a young Mohawk woman who lived in the 17th century who soon “will become the first Native American Saint (Catholic) in the United States of America. Many private miracles have already centered around Blessed Kateri, known as the Lily of the Mohawks, and the holy grounds at the National Shrine of Blessed Tekakwitha located in Fonda, New York. The Shrine was founded in honor of Kateri, for it was here that she was baptized on Easter Sunday April 5, 1676, and lived her teenage years. When Kateri was 18 years of age, she began instructions in the Catholic Faith in secret. Her uncle finally relented and gave his consent for Kateri to become a Christian, provided that she did not try to leave the Indian village. Witnesses reported that within a few minutes of her death, the pock marks from smallpox completely vanished and her face shone with radiant loveliness. Be aware that Kateri can be a contentious issue to Native American traditionalists. Before Kateri was declared a Catholic Shrine it was a sacred place for the Haudenosaunee and before that it was a sacred place for a pre-Haudenosaunee culture. On the grounds there are several ceremonial sites that are physically long gone but whose spirit and intention still remain. Although it is an apples and oranges comparison, spirit versus physical remains, the museum on the grounds has an archaeological display about the previous cultures from a dig done on the hill. As I have noted before prayer can draw energy (See The Ability to be Transformed,)to a place. This can leave a dowse able energy line that can be traced out with a pair of dowsing rods. Since different cultures had different spiritual practices often spiritual footprints will remain—some very distinct. I found several ceremonial circles and places of prayer on the grounds. The most interesting find was around the large oak tree at the top of the hill. I found the energy remains of three large ceremonial circles surrounding the oak tree. Each large circle was made up of several smaller ceremonial circles next to each other like links in a circular chain. The large central circle had 18-20 smaller circles and was flanked on either side by a circle made up of 8-10 smaller circles. This is a pre Haudenosaunee pattern. 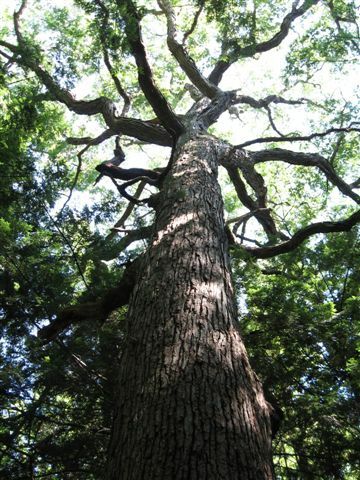 It is not surprising that a large tree would grow in the center of the large circle and that it would become a sacred site for another culture. The chapel also had several native ceremonial sites within it. All this illustrates that people are drawn over and over again to the same site. The St. Peter’s chapel should not be missed. It sits on a stacked(4) fields of consciousness. Prayer permeates the air and has created a powerfully positive samskara that can bring you to tears. It affords the opportunity for a strong connection to those that have been there before. All of these powerful thoughts/prayers have coagulated to create what I call a a Natural Vortice or Energy Vortex). See my Energy Vortexes--Cosmic Prana that explains how and why such vortices form. NPR story on Kateri's intercession to help a young body dying of flesh eating bacteria. Soak it up and add to the love. The chapel with its numerous natural vortices is very powerful and can help heal you and raise your consciousness. There are numerous ceremonial sites underneath the chapel space. 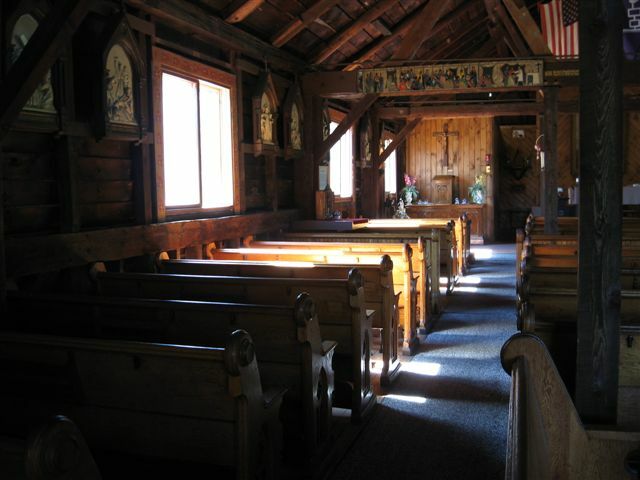 Spend some time at the middle last pews, or the back shrine area with the Kateri statue as you enter, or up front on the left hand side a few pews from the front. Try and connect with this space—it is divine. The pavilion sits on a stacked(2) field and provides a great space to just be and hang out. It is also a good place to learn and communicate. It is not surprising that the inter-faith community of the greater capital district hold its annual Peace Conference there. A contemplative and reflective walk in the woods is highly recommended. There are numerous sacred and special places throughout. The oak tree at the top of the hill should be experienced and seen. Several spirit lines intersect at the tree. While the space is not conducive to sitting down, it is worth experiencing. When we went to the spring beyond the excavated Mohawk village, I got the sense that I was leaving sacred space by having to cross the street to get to it—I would not advice going there. There are picnic tables available for eating on the grounds. . The chapel is open from May 1 to November 1 and there are services on Saturdays and Sundays. Numerous events are held there between May and November. The grounds are open year round. Kateri is located ¼ to 1/5 miles west of Fonda on route 5. Special thanks to Cathy Callan and John Amidon for their help and good work with their annual interfaith peace conference. To Lorraine Mavins for her photography.